Grandissimo is available in more places! The book now has a new paperback vendor: Barnes and Noble. It is also available from Amazon and CreateSpace. The ebook version is currently available from Kindle, Nook, and Kobo. The iBook is on the way—it was submitted and validated last week, but has yet to land in the iTunes store. Grandissimo is available as an ebook! The Kindle book has been available since Friday, and the Nook version went on sale today. If you want to buy the book for either platform, you can do it right now. It’s a bit more complicated for the other two platforms I’ve created ebooks for. Kobo is telling me that the book has been published, but there isn’t a page for the book in the Kobo store as of right now, so when you search for the book you get this. I’m hoping that the book page appears soon. When it does, I will, and you must believe this, let you know. EDIT LATER THAT NIGHT: The Kobo version is now available! Go here to see for yourself. The iBook version has been submitted. It validated on my first submission attempt, which was one little victory for me. I don’t know when it will show up in the store—it could be tomorrow, or it could be late next week. But I will certainly let you know when it does. Thanks to everyone who has bought the book—sales on both Amazon and Kindle have been respectable. If you like the book, I would be grateful if you could leave a review and let others know what to expect from it. I’ve got to give the folks at Amazon a lot of credit. According to CreateSpace, once you publish your book it will appear on Amazon in 5-7 working days. They were an order of magnitude off—it took less than 5 hours! Thanks to everyone who has gotten me here, and thanks to everyone who clicks that link and takes a chance on my book. 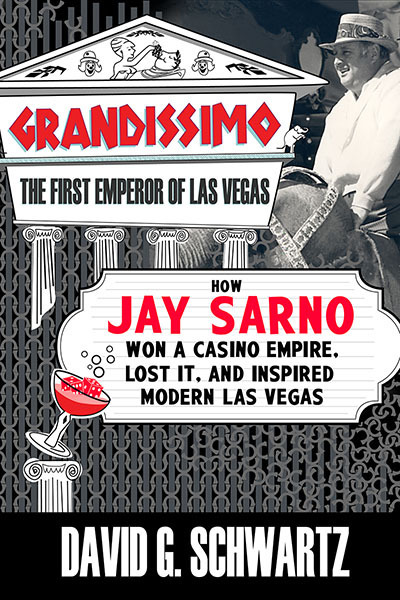 After years of work and lots of help along the way, Grandissimo: The First Emperor of Las Vegas, the first full-length biography of casino builder Jay Sarno, is available for purchase! As of right now (2am October 3, 2013), you can buy the book on CreateSpace. If past experience is any guide, the book will be available on Amazon by the weekend and other online sales outlets after that. Within a few weeks, you will be able to order the book from any brick-and-mortar or online retailer. Ebooks are coming as well. I have a few minor production issues to resolve there, and as soon as I do, I will be rolling it out on Kindle, Nook, iBook, and Kobo. I will post updates as the book progresses through its various sales channels. Another sign of Grandissimo’s impending publication: I have two ISBNs for the book. If you want to order the book from a retailer, you should be able to give them the paperback ISBN and, once the book has been populated in the Ingram catalog, they should be able to find and order it. You got a glimpse of it in the photo of the print proof—here is the cover in all of its glory. Brilliant work from cover designer Mr. Charles S. Monster—it matches the interior content in many ways, some of them quite subtle. 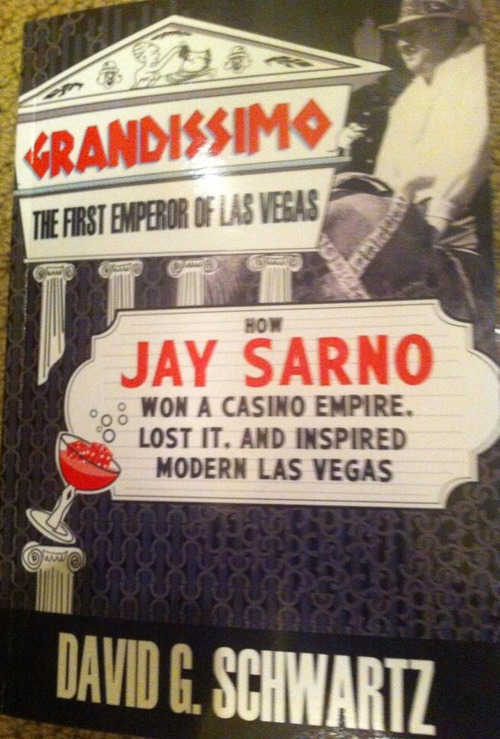 You’ll notice liberal use of Sarno block, an architectural element from Caesars Palace that to me perfectly represents Sarno’s design aesthetic. I got the print proof in the mail yesterday, It’s everything I had hoped it would be. Now I’m looking through the proof for any issues to fix before putting the book into print. Once I do that, I’ll start working the conversion to ebook formats. The book will be available very, very soon.